It's that time again.. Jay Stevens is calling for the re-naming of Cleveland's MLB franchise. Now that the Cleveland Indians are safely out of the playoffs, it's time to bring it up again. It's time for Chief Wahoo to go. In the news, it's been the Washington Redskins who have been under attack for their racist nickname, thanks to President Barack Obama pitching in. "If I were owner of the team," he said, "I'd think about changing it." The backlash was as predictable as it was appalling. "Leave the Redskins name alone, Obama," tweeted one observer, "and actually go do presidential things." "Obama said if he had a name that offended many people, he'd change it," tweeted another. "But HE DOES have a name that offends us!" Redskins owner Dan Snyder cited poll numbers that claimed few people were offended by the name, and ESPN's Rick Reilly took that idea a step further, saying his father-in-law, Bob Burns – an elder in the Blackfeet nation – wasn't bothered by the team's use of "Redskins." "It's an issue that shouldn't be an issue," Reilly claimed Burns said, "not with all the problems we've got in this country." "Too late," responded Reilly, "White America has spoken. You aren't offended, so we'll be offended for you." Only Reilly, um, misquoted his father-in-law. "My son completely misunderstood the conversation we had," wrote Burns in his own op-ed. "That's not what I said....He failed to include my comments that the term 'Redskins' demeans Indians, and historically is insulting and offensive, and that I firmly believe the Washington Redskins should change their name." Thanksgiving at the Reilly table should be interesting this year. Changing the name is a no-brainer. An Onion headline, as usual, summed it up best: "Redskins' Name Only Offensive If You Think About What it Means." 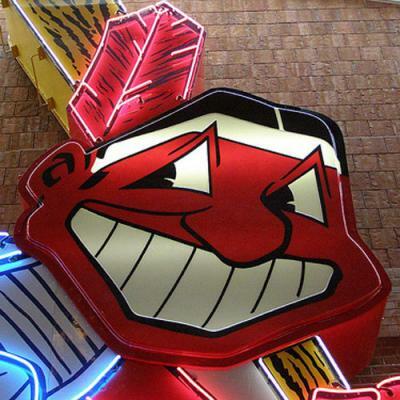 And that goes double for the grinning, red-faced racist caricature the Cleveland Indians use for their mascot. Chief Wahoo. I wrote about this last year, and probably will again next year – unless, of course, Cleveland ditches Wahoo. Which isn't likely, not soon. In April, team president Mark Shapiro reiterated the team's commitment to Wahoo. Indians' owner, Larry Dolan, too, shows no sign of shame. "They just don't have a problem [with Chief Wahoo]," said Dolan in a 2006 interview of asking Native Americans about the issue, the real-life Indians he encounters during his travels to places like, you know, Indian casinos. The claim that the name "Indians" honors an early Cleveland Native American ballplayer, Louis Sockalexis, is blatantly false. Fans constantly ragged Sockalexis, a player most famous for jumping out of a second-story brothel window, and when it was discovered he was battling alcoholism – which would eventually kill him at age 42 – the local papers said he suffered from "the Indian weakness." Many Indians fans react with insensitivity – or worse. "We killed all Indians a while ago," wrote an angry Indians' fan on Facebook to an article suggesting the team should lose the mascot. "Who cares!" And in the wildcard game that ended this year's remarkable Indians' season also ended with the unfortunate image of several Cleveland fans in "red face," having painted their faces bright red with grotesque grinning white teeth over their lips, on national television. "It's time to stop putting fans in a position where atrocious and insensitive remarks are used to represent the fan base as a whole," wrote Andrew Schnitkey of the Cleveland sports fan blog, Waiting for Next Year. "And it's time to stop using a symbol that offends some people. There's just no reason for it." So again: How much cooler would the "Cleveland Spiders" be?